Who should write your recommendation letters if you’ve been out of school for a long time? Schools stress that they prefer academic letters of recommendation (that is, letters that come from someone who has worked closely with you an academic capacity, preferably in a classroom). Older students have typically not kept in touch with their college professors, and typically have not worked in an academic capacity with anyone since their undergraduate years. So what do you do if you’re one of these older applicants who has been out of college for a number of years and find yourself at your wit’s end trying to find someone to write you an academic letter of recommendation that doesn’t sound like it’s coming from someone who barely remembers you (if at all)? You stop trying to get academic LORs. Yep, you heard me right: You stop trying. These are the traits law schools want to hear about, and they are the traits that these professional letters of recommendation can discuss. Use the questions in the LSAC Evaluation as a guide for what these professional (as opposed to academic) recommenders should bring up in their letter. As long as they address the same characteristics and features that an academic recommender would, their letters will still hold value within your application. Law schools understand that students who have been out of school for a while will likely be unable to obtain recommendations from academic sources, but will still welcome hearing about the student’s qualities from an informed third party. If you have any questions about how to handle these letters or what each school looks for in a recommender, call each school and ask–schools are more than willing to give you information on what they need to make a decision. Keep in mind, though, the ability to obtain only professional recommendation letters is something that only older applicants have. If you have were in college just last year, or within the last two years, then you need to obtain academic letters of recommendation, as well. Failure to do so will beg the question of what happened with you academically that you were unable to secure any academic LORs. Have a question about applying to law school you’d like me to answer? Send me an email. Check out the Admissions Tip of the Week archives! 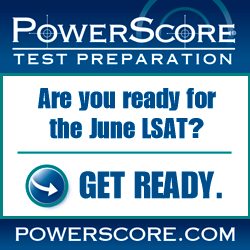 Find PowerScore on Facebook, Twitter, and Google+.